RUSH: Well, well, well, look at this. It is Page Six in the New York Post. 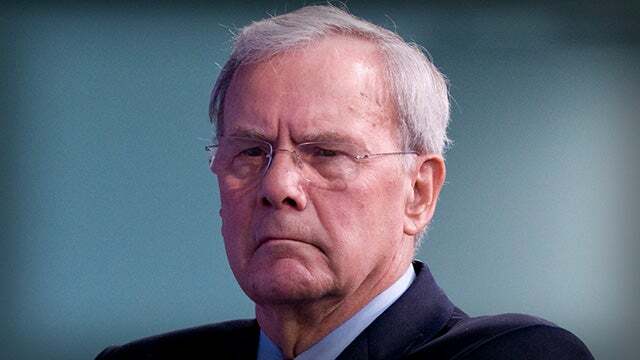 “Another woman has come forward to accuse … Tom Brokaw of making an unwanted advance toward her when she was a young reporter many years ago. Freelance writer Mary Reinholz wrote that Brokaw French kissed her inside her LA home during the 1960s after they met at a press conference and he helped her with a story.” This is now the third woman that has… Let’s see, there was Linda Vester, and then — What was it? — Shannon Bream at Fox who said she knew somebody who said that Brokaw had come on to her, and now this woman. “Reinholz added, ‘I wouldn’t be writing about this if wasn’t for … Brokaw’s disparaging remarks about Linda Vester … I believe her story is credible.’ Brokaw has strongly denied Vester’s allegation, likening it to ‘a drive-by [laughing] shooting.‘” So here’s the thing. All of these women at NBC News have signed this gigantic letter saying that Brokaw’s the greatest guy. Now, it turns out… (interruption) Oh, you didn’t know that? NBC sent a letter around, and a lot of people at NBC are now saying they were forced to sign this thing, that it was very, very plainly implied there could be trouble for those who didn’t sign it. But, now, the letter that they were all forced to sign was written by a Tom Brokaw producer who doesn’t work at NBC. He worked with Brokaw on a couple books and documentaries. She’s at Goldman Sachs now. She wrote the letter then gave it to NBC. NBC then sent the letter around and asked employees to sign it. The letter does not say Brokaw didn’t harass anybody. It just testifies to he’s a great guy. He’s a wonderful newsman, a great guy and looked good during the news. But it doesn’t specifically… (laughing) I mean, the signatories are not signing something that says they know for a fact that Brokaw is not a sexual harasser. (interruption) Well, I don’t… (interruption) Mr. Snerdley, who has a unique way of cutting through the noise, says, “Brokaw is pretty much done. “Why do they care about this now?” I don’t really know. I don’t know why Linda Vester popped up. What did she say? She popped up because…? (sigh) I don’t know. Something about some women not being believed or whatever. It was related to the #MeToo movement and hashtag or what have you. Anyway, there are three of them now. So I’m adding that to the list. Brokaw is clearly completely, totally discombobulated by it, and is acting like he doesn’t understand this at all, where this is coming from or why. Kind of like you, Snerdley. Like Charlie Rose. He was blindsided. He still doesn’t know what he did wrong. You know guys from a certain generation and culture… You know, these guys are all dinosaurs. Back in their day, women were pleased if they hit on ’em. They were stars.